We’d love your help. Let us know what’s wrong with this preview of Follow Your Star Home by Amy Quinton. In eight stories covering more than a thousand years, our heroes and heroines put this legend to the test. Watch the star work its magic as prodigals return home in the season Divided sweethearts seek love and forgiveness in this collection of seasonal novellas. In discovering the mysteries of the East, James has built a new life. Will unveiling the secrets in his wife’s heart destroy it? Highlands to Waterloo—can love prevail over fate? The past keeps Caibre and Aisla apart. Only Love and forgiveness can give them a future. 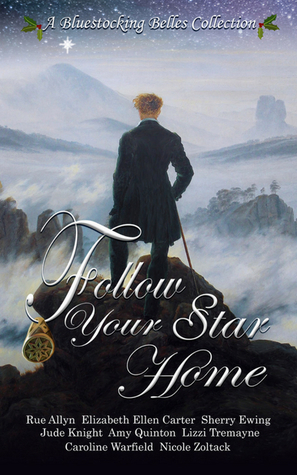 To ask other readers questions about Follow Your Star Home, please sign up. Sonja is totally alone with no family left and as she is out looking for food she stumbles upon fallen bodies littering her beach, she finds one survivor and heals him as her late Mother had been a healer. What Sonja doesn't know is that surviving man is none other than Anoundus. He ruled Sweden along side his brother as kings at one time, but not anymore. She had heard awful tales of Anoundus and just the thought of him made her stomach churn, but she couldn't just leave a man there to die if she could help him. What kind of life will he face here? What role will Sonja play in his life? With the two find love this Yuletide? Nicole Zoltack did a wonderful job with this story. The storyline was great and I really enjoyed the characters. Now I'll have to read part two because I want to know more. James wants nothing more then to end a long journey in the arms of his loving family, but his father's agents offer him forgiveness and a place in society if and only if he will abandon his foreign born wife and children to return to England, but James doesn't want to go back even though his father demands it. He even sends a bevy of different people to talk to James into it. Mahzad faces revolt, invasion, and betrayal in the mounting kingdom they built together while her husband is away although she will not allow their dream and their family to be destroyed. Mahzad has her own problems in her kingdom and as queen wants nothing more then her king to come home and meet their little girl who was born while he's been away. Will James go back and reunite with Mahzad? Will they be able to get the danger away from their door and have a happy life? As usual Jude Knight brings a fantastic tale of love with a story that flows wonderfully. I really enjoyed the background as it gave me the insight into who James and Mahzad really were as separate people and as a couple as well. Robbie as a boy can not believe what he's seeing. So many people walk with crying babies, some limping, and others on carts piped high with all their worldly belongings. He asks his Father where everyone is going and he tells Robbie To the Coast because their laird wants the land for their sheep. Then they turn around and go home. Robert has refused to become clan tacksman after his father and is disowned for it. Sofia's waiting turns to despair when her Mother buys safety during the clearance of their village at Sofia's expense, leaving her to the lusts of the laird's son. The Lairds son has abused her and tormented her beyond reason. Robert has now emerged from the hell of Waterloo wanting nothing more then to see Sofia and and his father. He sees his Father and finds out some disturbing new about Sofia. Will her go after Sofia? Will Sofia be able to face Rob after what she's been through and will Rob be able to accept Sofia? This is the first story from Lizzi Tremayne that I have ever read and I must admit she did a great job and I thoroughly enjoyed reading it. Rob and Sofia's story touched my heart as the star crossed lovers that they were. You know Lord James Quill 8th Marquess of Mobley and heir to the Duchy of South Warkshire, first fell in love with his best friend, Miss Annie Merryweather, when her was ten. She had loved him too then until one day she didn't. He constantly thought of her. Ofcourse he did. James Quill now the 7th Duke of South Warkshire, tried to shake off images of an imaginary idyllic life with Annie Merryweather. He sits in an opium den drinking and playing cards now while he thinks of her. He has won his hand. A hand that consists of general things. Then he finds a ring which he picks up and is surprised to find it warm almost hot. He slips it on his finger and is instantly slammed back in his seat by some unseen force. Later, he wouldn't recall walking out of that place, nor how he made it to his sleeping quarters. All he could explain was the sudden desire to return home. And he does return home. When he returns home he meets Harriet and she shows him her plan and tells him he must follow all of the steps to a tee if he wants to win Miss Merryweather. His Grace, James Quill, will not be a bachelor-in-poor standing for very much longer. For I, Lady Harriett Ross. Yes it is I the same Lady Harriett Ross of the Infamous Umbrella, have decided to orchestrate his betrothal to his former best friend, Miss Annie Merryweather, weather either of them wishes it. You know me though they will wish it. Either way I'm surprised that His Grace has agreed to my proposed 10 step plan. Ofcourse Her soon to be Grace is determined to resist the notorious prodigal son. Do you think they will find love and forgiveness this holiday season? I guess time will tell. As always I truly enjoyed Amy Quinton's story from the Umbrealla Chronicles. The story had a great flow and I really came to like the main characters. I always love Lady Harritte and her stories as they warm the heart at Christmas time. Calibre MacFearann doesn't want to return to Scotland in fact it's the last thing he wants to do, let alone being forced to stay there however the chance of rekindling his lost love of his youth is just a little too hard to resist. Aisla Mackai got hurt so bad losing Caibre MacFearann's love that she wants absolutely nothing to do with him when during a blizzard he end up on her doorstep. Human charity and kindness demand that she give him shelter no matter how cruel he once was. The past keeps Caibre and Aisla apart. Only love and forgiveness can give them a future together. Rue Allen did a fantastic job with this story. It held my intrest from start to finish and I really enjoyed it and hope to read more from Ms. Allen in the future. Harry is upset becuase he has a permission to marry form, but can't get leave to go marry Rosemarie and how on earth can he marry her if he can't find her. It had been over a year since Harry had seen Rosmarie his lover and months since he last had any word from her. It was only the love for Rosemarie Legrand that gave Harry the will to go on during the horror of trench warfare. Now the war is finally over and he can't find her. Rosemarie waits for word on her cousin's farm where she had to take refuge when war finally reached the outskirts of Amiens. He must have gotten her letters right? Or has he simply forgotten her after all this time? Wow what a great story I remember this story from the last Belles Christmas book and it was so nice to revisit with Harry and Rosemarie. It was very heartwarming as I could almost feel these star crossed lovers love and how frantic they were searching for each other. The ending was so wonderful and I really enjoyed it. Helen Watson has arranged for a job for an out of work soldier at her workplace, totally unaware that she's the miracle Robert Fairmont needs. Robert has returned from the great war a new man with a new name. Having a job in his father's factory is the first step towards reconciliation. Can Helen forgive him for hiding his true identity or will Robert end up losing his one true love and his father? All he really needs is A Fine Chance. Elizabeth Ellen Carter did an amazing job with this follow your star home story. I really enjoyed it and there's something so heartwarming about a prodigal son returning home to acceptance and then the love that's found. Sherry Ewing did it again. I ended this lovely story with tears in my eyes. Wonderful happy tears. This story was quite Brilliant. I felt like I was sent back in time with Jade and watched the story play out. An Amazing Collection by authors also know as the Bluestocking Belles, who create stories that will warm your heart. I truly love each of them individually but in these seasonal novellas, a mystery is created around a Viking star ring that made it way through the centuries and touched each story. Intrigued? Scotland 1170 and USA present day. Two people separated by centuries find their destiny through the magic of the ring. Tomas of Clan Kincaid has lived with distant An Amazing Collection by authors also know as the Bluestocking Belles, who create stories that will warm your heart. I truly love each of them individually but in these seasonal novellas, a mystery is created around a Viking star ring that made it way through the centuries and touched each story. Intrigued? Two people separated by centuries find their destiny through the magic of the ring. Tomas of Clan Kincaid has lived with distant relatives since his father disowned when he was given a ring by by him that he lost. Even then he had a vision of a girl named Jade who seemed to have a connection with him. In present day USA, Jade Calloway is always alone except for her friend Zoe who predicts she will go on a journey as Christmas approaches. Then a ring with a star appears and as she puts in own, she starts to have visions as before and she sees Robert who seems to be calling her to come to him. Can this really be happening? Can she finally be with the man of her dreams and find love? Sherry Ewing always grabs my heart in her stories and does not let go until the end. I am drawn in by her characters and surroundings as she writes her marvelous prose. Loved it! Kattegut 839 As Sonja goes to the beach to wash her feet she comes upon a battle taking place with the two factions killing each other. All lay dead at the end, but she sees a movement and there is one Viking still alive. Her only option is to help, because she is a healer, just like her mother. That moment changed both of their lives forever! What she does not realize is who he is, Anoundus, a former king of Sweden he shared with his brother. But he tells her he is Magni. I loved these two characters. They were brought alive with the descriptions by the author and I could visualize the surroundings. They seemed meant for each other with Sonya alone since her brother died and Anoundus having his own problems away from his home. Could these two from different lives grow to find love? Will Anoundus be able to not go back to his homeland and stay with Sonja? At the end the he brought out his coin purse and held up a simple golden ring with a multi star on it his mother had given him years ago. Worn on her wedding day she passed it to him so he could find true love. But what power did the ring have? Even though this is a novella, he really contained a great story and I look forward to reading more about these two!! A love thought lost is regained in this wonderful story set in 1794 northeast or Iran. James has built a life with his wife Mahzad and they are rulers of their small kingdom. Now, having been together through eight children and over a decade, each feels the other does not love them anymore. Of course they might ask each other, but maybe afraid of the answer. But there seems to be a lot in their path to keep them apart and trying to regain that feeling. A well written story that brings the characters to life and the surroundings alive. Truly enjoyed this novella. Lairg Parish, Scotland Rob Gunn wants Sofia for his wife but her father refuses his request. If that were not bad enough, when he refuses to become a tacksman like his father, he is disowned and leaves to make his way but determined to return for Sofia. There are many so many trials to overcome. Take the journey to see how the two can ever be together and the emotions they go through to get there. When I read the title to this story, I knew I was in for a good story that would have me smiling. James Quill finally returns home after being gone over a decade. Winning a ring in a card game, he wants to go home and see if he can win Anne as his bride. But as you know, the matchmaking maven Lady Harriett Ross gets involved when James asks for her help. The plan was a good one for winning Annie over if her could just follow all the steps! A really fun story. A continuation of Caroline's story in last year's Never too Late anthology, we find Harry trying to find Rosemarie so they can marry. It had been a long time since he had seen her due to the war and many months since he had heard from her. Rosemarie was his everything that gave him strength to endure the horrors he saw in warfare. Unbeknownst to him, she was at her cousins farm waiting to hear from him. A heartwarming story that brings true love together when it needed to be found. Helen Watson works at a factory and helps a soldier returning from the war gain employment with her workplace. Robert Fairmont has returned with a new name and wants the job at his father's factor to help him possibly reconcile with him. He sees Helen as his miracle to his future, but he does not tell her his real name. Can she overcome his deception and can they find their happy ending? A wonderful story of hope and the chance to be happy. This is an engaging collection of novellas written by the authors collectively known by their fans as The Bluestocking Belles. Each author's unique style shines in her character-driven installment following the path taken by a simple signet ring imbued with the "power" to unite or reunite the wearer with his or her true love. I enjoyed the variety of historic eras and places in which the stories were set. Some were time periods not often used as the backdrop for romance. The political and social This is an engaging collection of novellas written by the authors collectively known by their fans as The Bluestocking Belles. Each author's unique style shines in her character-driven installment following the path taken by a simple signet ring imbued with the "power" to unite or reunite the wearer with his or her true love. I enjoyed the variety of historic eras and places in which the stories were set. Some were time periods not often used as the backdrop for romance. The political and social climate of the settings were brought to life in narrative that moved each plot forward, providing well-defined worlds for each story's casts of characters to brave opposition, and in some cases great danger, to find their way to a satisfying conclusion. Each year since I've known them the lovely Belles have produced a beautiful anthology between them at Christmas and each new one becones my favourite of theirs to date. This anthology we have some new Belles joining us and every story is brilliant, pulls you right in, the magic of Christmas time, love and a little more te magic, along with Friends old and new, joy, some tears, some deviousness, some foes all coming together to make this magnificent anthology even more magical. Sonja is alone & whilst out looking for food stumbles across bodies on the beach. There is a lone survivor who she tends to & heals – her mother had been a healer. The survivor is Anoundus a banished king of Sweden. They spend time on a beached longship whilst Magni (Anoundus) heals. An engaging read of two people finding themselves & learning what is important. I now need to fin out what happens in the second part of the story! In discovering the mysteries of the East, James has built a new life he’s married to Mahzad & they rule their small kingdom together but after over a decade together and eight children, they each think the other isn’t in love any more. There are obstacles in their way, interfering fathers, a threatened invasion. A lovely novella which I read in a sitting, James & Mazhad both desperate to be together but circumstances keeping them apart. As always great characters & a well written well paced story & I hope there could be another Redepenning novel to come? Rob Gunn sees people leaving as the laird wants the land for his sheep. Seven years later Rob asks Sofia Gray’s father for her hand but is refused. When Robbie reuses to become tacksman after his father he is disowned & leaves promising to return for Sofia. Things aren’t easy for Robbie & Sofia & they have many trials to overcome. An emotional read that really made me feel for Robbie & especially for Sofia. I again read this in one sitting as I couldn’t put it down. I would have liked an epilogue which dealt with Sofia’s mother & how they fared. James Quill Duke of South Warkshire returns after a decade away. He wins a ring in a card game in an opium den & realises he needs to go home & hopefully win Anne Merryweather. He seeks professional matchmaker for matrimonial assistance. Caibre didn’t want to return to Scotland afterall he's made a life for himself in America & has been successful. Aisla has been holding everything together since her brother Steafan was presumed dead. When two men end up on the doorstep Aisla’s life is changed. A lovely story of love & forgiveness, great characters, well written had me enthralled from start to finish. All he needs is a fine chance Robert Fairmont has returned from the Great War with a new name, given a job at his father’s factory by Helen Watson all he wants is a chance to make amends. Sometimes it takes a miracle to find your heart’s desire. Scotland 1164 Tomas is banished for losing the star ring & now serves at Berwyck Castle. Present day Michigan Jade Calloway is alone then she's told by her friend Zoe that she'll go on a journey, a ring appears as she sits on the sand in San Francisco & she dreams of a man. Another brilliant story, I really felt I was with them. Each year the Belles produce an amazing anthology & this years is brilliant the mix of stories, eras genres all mesh together to form a lovely set of novellas & of course there’s the star which has the characters needing to go home. As a taster of several authors' styles, this is a mixture and an interesting read. My favourite is Elizabeth Ellen Carter's 1920s story of a young man home from WW1, wiser and mature, and determined to prove to his father that he is not the same brash man who stormed out of home several years earlier. The Viking story was interesting in setting, but I was disappointed when I got to the end, only to discover it wasn't the full story. If you want to know how the revelation of the main character's As a taster of several authors' styles, this is a mixture and an interesting read. My favourite is Elizabeth Ellen Carter's 1920s story of a young man home from WW1, wiser and mature, and determined to prove to his father that he is not the same brash man who stormed out of home several years earlier. The Viking story was interesting in setting, but I was disappointed when I got to the end, only to discover it wasn't the full story. If you want to know how the revelation of the main character's true identity pans out, you have to buy that author's full book. I prefer short stories that wrap up the threads fully. Another story is set in a fictional Middle Eastern country where a disowned English son of an earl has married and become 'kagan' (a kind of king). I got lost in a slightly rambling narrative, and couldn't work out where the 'star' of the title fitted in. A positive of this story, however, was the strong female protagonist, although even there, her reaction upon the appearance of the 'English friend' of her husband felt a bit over the top, as the rest of the time, she was clear thinking and in control. What a wonderful set of stories by remarkable authors this book is! I so enjoyed each story individually, each author did an awesome job of writing their own story about the very magical Viking star ring. Set in various eras, the ring brings couples together that are meant to be!! Thank you to the Bluestocking Belles for writing such amazing stories for us to read. May we all have such a ring!! Follow Your Star Home. The book was an amazing experience. The stories were like you were there hoping everything will work out for each couple. There was laughter and tears throughout the book. I didn't want to read the last few pages, because I didn't want the book to end.Thank you all for writing a wonderful story for this book.